Nowadays everybody takes sites like Google and Amazon for granted, whether it is to quickly find relevant information or to upsell relevant products, we barely notice how machine learning optimises every day experiences for us. Now Sitecore’s Commerce platform has matured, Sitecore has become a fantastic option for ecommerce sites. Not only does it provide the traditional features you would come to expect from an ecommerce provider, it is combined with the most advanced customer experience platform. This enables marketers to deliver truly engaging experiences for users. Coveo is a market leading search platform which seamlessly complements Sitecore. It brings a familiar search experience for users which reduces frustration and abandonments and enables marketers to control search rules rather than relying exclusively on developers. 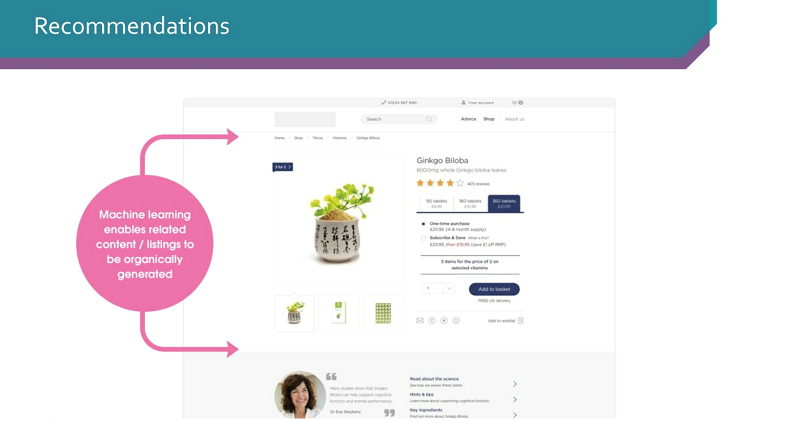 Coveo is perfectly suited to ecommerce sites as traditional product listings can be replaced with Coveo result listings to create powerful category pages. These listings can be further enhanced with personalisation to adjust the results based on matched personas. A powerful search alone is great, but to make the most of it you need to understand how people are using it. Coveo comes with powerful usage analytics functionality which captures data about how people are using the search as well as supporting site-wide page tracking. Within Coveo Usage Analytics it is possible to quickly see which queries have low relevance or no results. This means marketers can easily see how to tune and improve the search. This might be interesting, but where does machine learning come in? It is about going beyond search and putting relevant information at people’s fingertips. 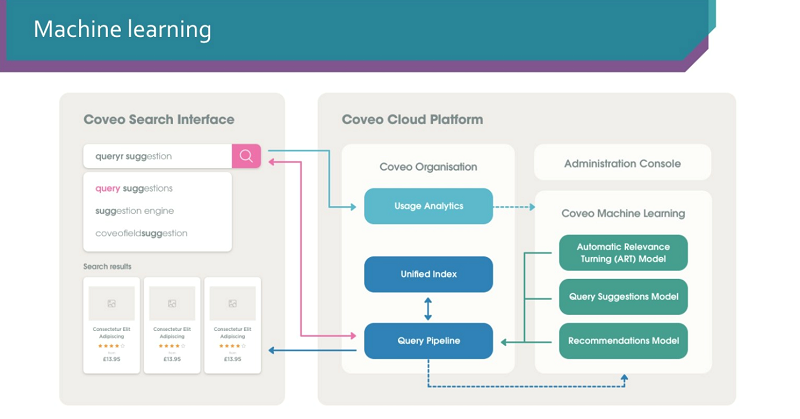 Coveo Machine Learning learns from the data captured in Coveo Usage Analytics by analysing behaviour patterns to understand which results and content lead to best outcomes. Coveo for Sitecore currently supports Machine Learning in three separate ways: tuning results, query suggestions, and recommendation engines. Automatic relevance tuning works by capturing data in analytics about which results are most successful for a search. Coveo Machine Learning then adjusts future search results so best performing content appears nearer the top. For example, on an ecommerce site users might be searching for products based on the type of item, yet in your results products are listed using brand names. Rather than having to create some complex synonyms Coveo Machine Learning will automatically learn these rules and make results more relevant. For common scenarios, it is recommended to train the models prior to launch, however, in general a launch and learn approach should be adopted. The final aspect of Machine Learning in Coveo is recommendations. It works by learning from recorded navigation history, such as search activities and page views. Based on these previous journeys users have taken through the site, it learns what content is related to each other. Coveo can then recommend other content based on the context of what a user is viewing. This feature is important for ecommerce sites as it enable you to create recommendation pods that automatically promote other products and articles. It can be used in diverse ways, such as Amazon-style pods for recommending related products or suggesting relevant articles on product pages to supplementary relevant content. We feel that Coveo becomes a perfect fit for ecommerce sites; it powers your listings and with Machine Learning brings relevancy and recommendations. If you are planning on creating your next ecommerce site, the powerful combination of Sitecore Commerce and Coveo, along with Machine Learning, can deliver engaging experiences that provide relevant information for your users. This in turn leads to an increase in transactions and revenue because it reduces frustration and abandonment – something that our ecommerce clients always strive to do to meet business objectives.